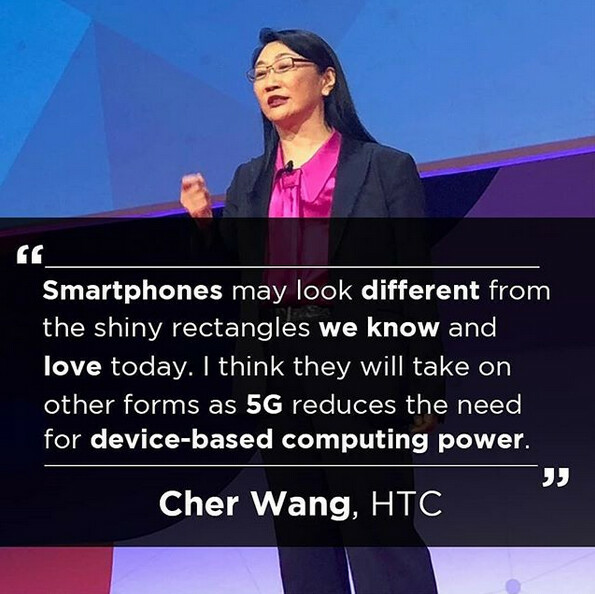 HTC co-founder and chairwoman Cher Wang made some interesting comments that were posted on the manufacturer's Instagram account today. Talking about the upcoming move to next-gen 5G connectivity, the executive stated that as 5G reduces the demand on these devices to provide computing power, the shape of a typical smartphone will change to "other forms" from the rectangle based design that handsets now offer. 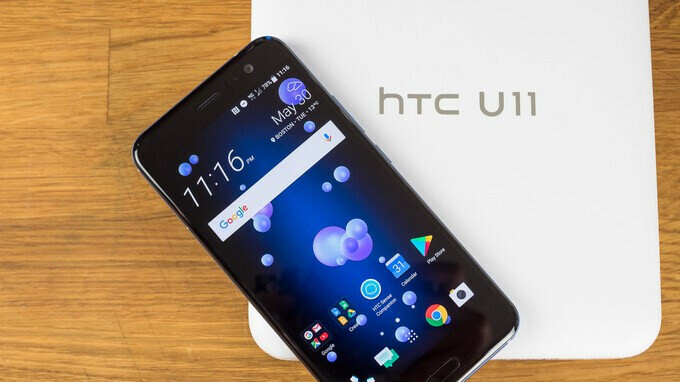 Wang's company has problems, and while the HTC U11 was a big step forward for the manufacturer, it has the same seven-letter problem every year. Samsung. To be fair, LG and other Android producers that sell flagship models in the U.S. have to deal with the world's largest smartphone manufacturer, not to forget Apple. But even if we focus solely on Android, HTC needs to find the innovative spark that brought us the HTC EVO 4G and the HTC One (M7). Edge Sense was different, but squeezing the sides of a phone to open the camera or an app is not going to drive sales. So even though it has been a major struggle for Wang (the stock has dropped in Taiwan from the equivalent of $44.44 USD to $2.09 USD in nearly seven years) and HTC continues to bleed red ink mightily, the fact that Wang is talking smartphones and 5G seems to bode well for fans of the company, worried that it might just give up the ghost. Of course, it helped that HTC received $1.1 billion from Google at the beginning of the year when the deal that sent HTC's smartphone design division to Google closed. Now, it's time to use that cash to design smartphones so different, that HTC can be relevant at the flagship level once again. And to that end, it sounds like Wang can push HTC in the right direction. What she meant was : we are going to slap SD 450 chip into our new 5g flagships and price them like there is no tomorrow. Anything that comes out of her mouth or HTC in general is almost comedy these days. That was some good comedy from you anyway. A new 5G enabled notch. Fast track to bankruptcy. Seriously good luck reducing performance and offloading it over the network with data caps and dead spots all over. It will result in horrible user experience and high data usage. This sounds like some heavy BS to me. Sure, one day, smartphones will evolve from their candy bar designs. I'm not naive enough to think that we've reached anything close to the ultimate experience. But, whenever that happens, I highly doubt 5G will be the reason. And HTC sadly might not be able to be part of that given how they are just going way more down and down. At least she wasn't imprisoned like the head of Samsung was. You sound ignorant, what because they didn't listen to you about something? Now if you said something like they lose money because of the media and marketing continued glorifying of overpriced phones like apple and samsung (which BTW gives them reason to continue to raise prices!) then I'd say you're on point. Far be it from me to criticize HTC, although, unlike them, I made money last year, but what shape were they thinking of? Here are some of the information sources that are rectangular - paper, photographs, newspapers, magazines, television, movies. Other than music. I can't think of any source that's not rectangular. So, unless she's talking about some sort of music player and phone hybrid, she's just blowing smoke. U11 was cheaper than i8. And better at every aspect. Ppl complain about price.. Removal of 3.5mm was f**king bad decision also let's not forget about the embryo U ultra... Bad f**king decisions all over. Btw almost forgot, certainly their new flagship will have a beautiful notch. Wrong...just because you didn't like it doesn't mean removal of 3.5 port was a bad decision, there was no ill effect from it from actual usage...also the Ultra suffered the same fate as the other flagships, no marketing and saturation of marketing by samsung and paid reviewer$. BTW HTC doesn't follow Apple design leads, it's the other way around...but how apple arrived at the horrid notch is all on them, not HTC. Year after year HTC sales decline. I wonder why can't they listen to consumers. What would you like them to listen to from their customers? Go head speak for everyone. I'm sure you and the others here know exactly what it takes to build and maintain a mobile device business in the type of ultra competitive market we've had for the last several years. Yea, I'm gonna go with the people who have been doing it for years rather than someone who just wants wireless charging in their phone or for them to bring back the 3.5 jack. don't know why but that is only one of few major problems they have like their inability for HTC to market their product whatsoever. With this company declining year after year who knows how long HTC will last. Why she is still in office?! She is the owner of the Company. However, She lost all credibility when she was caught using an iPhone out in public while shopping instead of her company's critically acclaimed M7. That snafu caused a sort of black stain on the company. If your not willing as CEO to use your own company's product what does that implies about value of work your employees put in to produce said product and what does that imply to the general public? As a former fan of HTC I have to say that was one of the reasons I decided to move away from HTC the other was the stubbornness of former design chief Peter Chos to continue with the thick bezels and 4 ultra pixel camera on the M8 while every other manufacture had settled on 12 to 16 mp. The third reason was the marketing or lack of marketing ( paying Robert Downing Jr half a billion dollars for a commercial that made no sense at all in promoting the M7/M8. I mean how can you have him and not his Iron Man persona to go along with the promotion that cost you half a billion bucks?). Cloud based computing power...oh no.